Back in October, IxDA PHX hosted a ‘Design Thinking Workshop’ as part of Phoenix Design Week 2014. I’m one of the local leaders who helped organize the event. We had over 100 people signed up, which was great. But when the big day finally came, we ran into a big problem: Nobody could find the place! The meeting was at a relatively new Tech Collaboration Center in Tempe, right on Mill Avenue. Google maps could lead you to the address. But it was a three story building that wrapped around a corner and connected to other buildings on either side. There was no obvious entryway. Instead, what you saw was a Bank, a smoothie shop, a clothes store, and a bunch of other college-town businesses. The Tech Center was up above on the second story, and the door to the Tech Center was a nondescript metal door set back from the road that also served as an entryway to 3rd story apartments. I knew right away that our 100 or so guests would face the same problem. Thankfully I also knew a simple solution – one that I’d used before as a UX designer. It was time to play Traffic Cop! 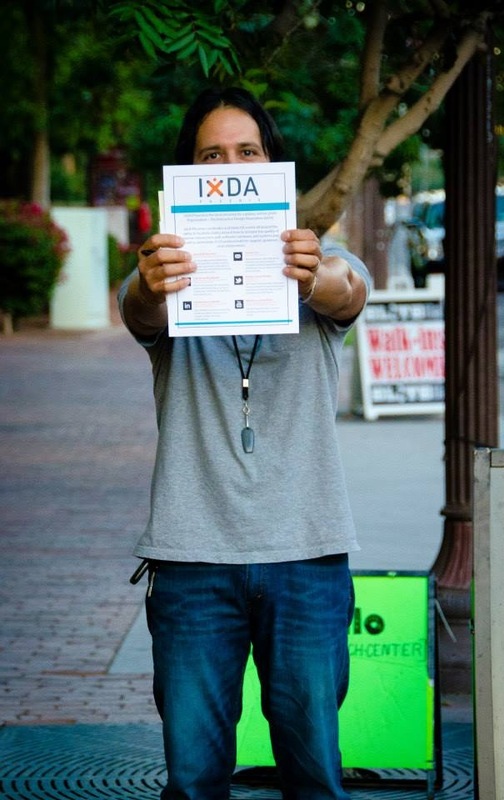 I grabbed an IxDA PHX sign and hoofed it downstairs to the street to catch people as they walked by. Some of our guests saw me holding the sign and gravitated right over. Others I’d see wandering around looking confused and ask them if they were looking for the Design Thinking Workshop? Yes? Right this way! It wasn’t the ideal situation, but being a Traffic Cop for 45 minutes solved the problem and got people into our event. And that’s all that mattered. So how does this relate to the design world? I once faced a similar situation with a CRM solution I was working on. The Engineering group had rushed a SaaS version of their installable CRM software into Beta in time for a big Partner event. I remember hearing about the project early on. There was “no time for design”, they said. We had to let the engineers crank on this one in order to meet the tight deadline. Fine, I said. UX is busy with our own projects right now. But tell you what… How about we set up a user testing lab at the conference (we were going anyways) and get some of the Partners to test drive the Beta solution first hand? Everyone liked that idea. Our Partners loved getting their hands on new products and giving their input. So we did it. And guess what happened? These seasoned veterans who knew our installable solution through-and-through couldn’t complete the most basic task of entering a new contact into the system. Nine out of nine people that we tested on the first day got stuck. It turns out the engineers had to break up the workflow people were used to in the installable solution when they re-built it online. 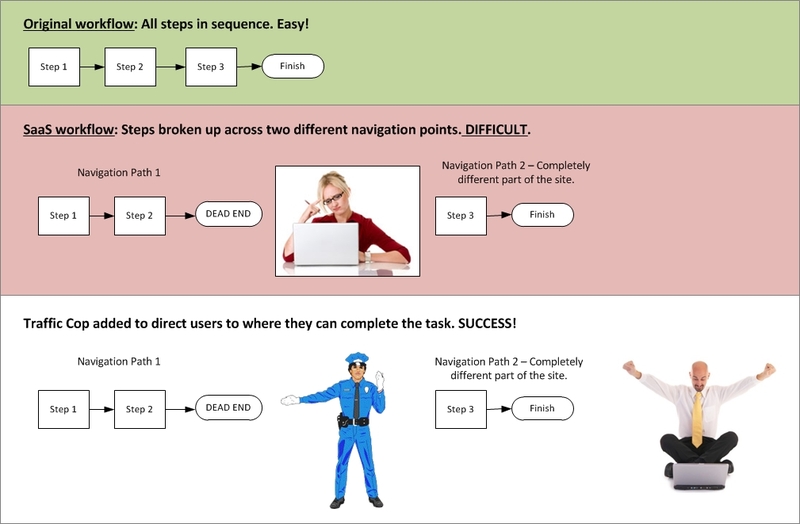 The SaaS solution had the users start the task in the same place they were used to, but to finish the task they had to jump over to another screen buried under a different menu. And nobody could figure that out. We (UX) talked to the engineers and the Product Manager the first night after the testing and told them about the results. It was a bad situation. There was no time to redesign the whole workflow before release, but we couldn’t leave it how it was. Nobody could use it! And that’s when it dawned on me. Let’s put in a Traffic Cop. We’ll insert a link right at the end of the first set of tasks that jumps the user to the other page where they can finish up. It’s not the most elegant design in the world, but it should do the trick. We knew from the testing that people were stopping right at a certain place in the UI and looking for what to do next. With a link to guide them, they’d be all set. We had the developers add the link that night. And we tested seven more users the next day. Bingo. Seven out of seven completed the task! In the real world, when the power goes out and the traffic lights stop working; or when there’s an accident or big event and traffic needs to be re-routed, they call in a Traffic Cop to help direct people to where they need to be. In the design world, you may face a similar situation. It’s not an ideal situation, but you’ll have to deal with it somehow. If it happens to you, remember the Traffic Cop solution and see if that can help get you through. Sometimes the old techniques work best. On a recent project, one of our lead UX analysts ran into a situation where some long-standing usability issues were impacting the success of a soon-to-be-released new feature. Everyone knew about these UX problems. They were discovered in past Betas and user testing sessions and had also been reported by customers via feature requests and Support calls. But when it came time to decide on what’s in vs. what’s out for a release, they never seemed to make the cut. In fact, the lead UX analyst had just lobbied for some of these very issues to be included in the current release – but no luck! So now that they were staring her in the face again she knew she needed to do something different to make the problems resonate with the project manager and project stakeholders. She crafted a usability test and invited them to attend. While some of her fellow sprint team members made it to the sessions (always a good thing) the product manager and stakeholders did not. That’s okay. She had recorded the sessions. And when it came time to present the findings she showed them sample videos from the tests to really accentuate the difficulties that the users were having. 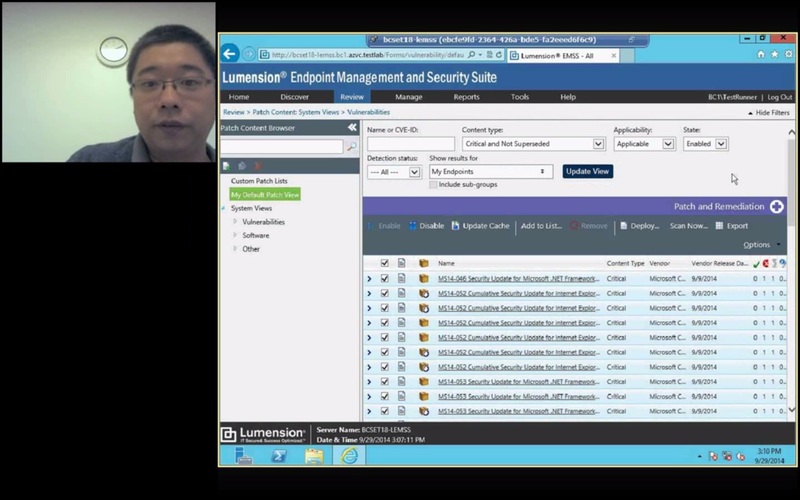 In the first clip, she demonstrated an issue with selecting multiple rows in a list. If you click anywhere outside of the tiny little checkbox icons you lose all your previous selections. (ARGH!) It sounds fairly innocuous in the grand scheme of building a feature – the user can just try again, right? But to the user, this seemed pretty ridiculous. He had to laugh as he tried over and over to make it work and kept missing the mark. It was clearly a bad UX. 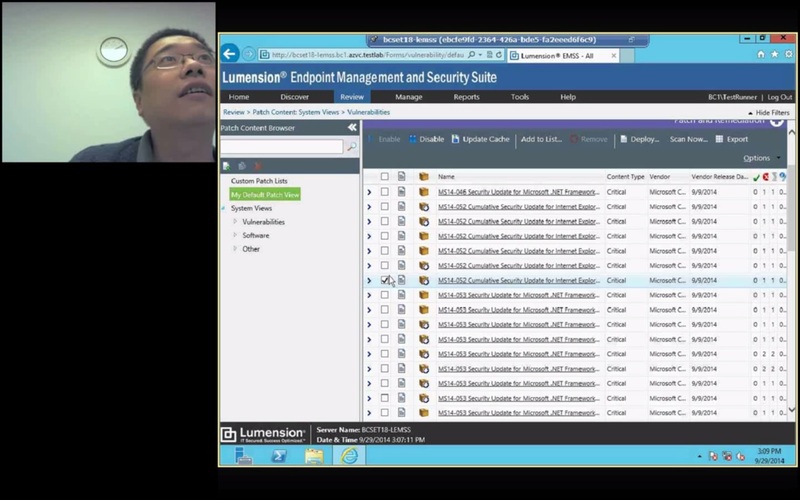 Usability test clip 1: User selecting multiple rows – but watch out! Don’t click too far away from that checkbox! Usability testing clip 2: Users reaction as he loses his row selections by clicking a pixel or two outside of the checkbox. What is going on!!!??? In the second clip she showed a user searching for a custom list he had just created. The user wondered out loud, “Did I forget to click OK?” Apparently he thought he may have forgotten to save the list. He moved his mouse pointer to the area where the list was supposed to be on the left side of the screen. “I would expect to see something here” he said. But he didn’t think to click on the tiny gray chevron. It didn’t look clickable anyways. It looked disabled. But that’s where the list was hidden – behind the collapsed tree node. 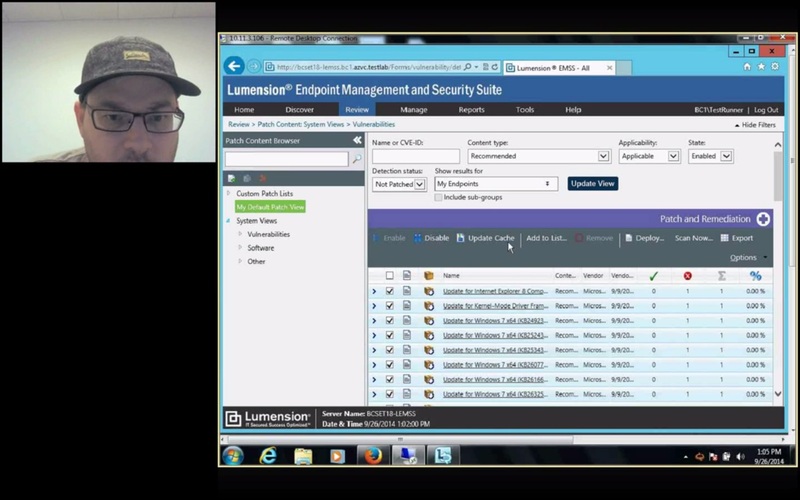 Usability testing clip 3: User searching the screen for the new list he just created. (It’s hidden in a collapsed tree node.) Note the frown on his face as he scans the GUI. I was in the room when these clips were shown to stakeholders. To the credit of the lead UX analyst, she wove them perfectly into her overall testing summary. The response was just what she had hoped for: Seeing the users made the problems real for project stakeholders and now they wanted to do something about it. And that’s the old trick that worked so well to blow the dust off of those “old news” usability issues and make them new again. All it took was getting some fresh evidence and rolling the tape. Remember this the next time you are trying to get a point across with your stakeholder / product manager audience: Seeing is believing. It’s crunch time again: Just one more iteration to go before code freeze in our next dot-X release. And once again we’re right down to the wire, hoping to get the marquee feature done on time. A lot of work went into the design from a UX perspective. Customer calls, use cases, design reviews with peers in UX and Architecture, and even a preview of UI mockups with a key customer to get early feedback. However, we just had the second-to-last sprint review (it was about a five iteration project) and seeing the feature nearly complete raised several concerns from the internal stakeholders. There are some places where they think users will be confused. And there’s a bigger, underlying concern that the feature won’t meet the users’ expectations. After all that work the feature still seems a little shaky. But for the love of God, why? I think I know the answer. And there’s a lesson from the movie ‘Pretty in Pink‘ that explains why. Well, the lesson actually comes from the making of the movie. Let me explain. A while back I read a book called, “You Couldn’t Ignore Me if You Tried: The Brat Pack, John Hughes, and their Impact on a Generation“. It was a perfect guilty-pleasure read about a bunch of iconic teen films from the 1980s like “Sixteen Candles”, “The Breakfast Club”, “Ferris Bueller’s Day Off’, and yes, “Pretty in Pink”. 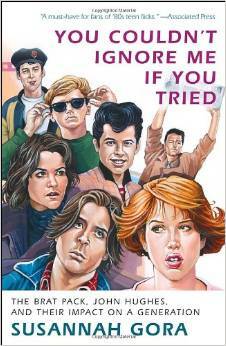 Awesome guilty-pleasure book for anyone who grew up in the 80s or just loves these classic teen films. 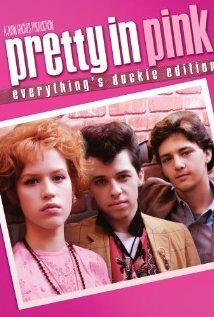 For those who aren’t familiar with the movie Pretty in Pink (which should be nobody, come on!) it’s a teenage romance about a punky high school girl from the wrong side of the tracks named “Andie” who falls for a dreamy rich guy, “Blane”. Her best friend, a boy named “Duckie”, is secretly in love with Andie, too. Much drama ensues as Andie and Blane try to establish a relationship across social classes in advance of their Senior Prom, with all of their friends seemingly against them and treating them badly. What I learned in the book is that the original script had Andie hooking up with Duckie in the end. It was supposed to be a tale of true love born of friendship vs. falling for the rich, dreamy, popular guy (aka the Prince Charming) and riding off into the sunset. Hooray for the underdog! The kids loved the rest of the movie but they hated the ending. And in the exit surveys, they ended up saying that they hated the film. After getting this feedback, the filmmakers went back and re-shot the ending so that Andie would indeed get together with Blane and when the movie was finally released it went on to become a huge blockbuster hit. So what’s the connection to UX and the big marquee feature that my company is trying to get out the door? If you’re looking for a commercial success, there’s no substitute for getting direct feedback from your target audience on a ‘final version’ of your project . Final version being in quotes, of course, because the point is to get feedback and make the necessary changes before you release. And in our case, we haven’t tested a complete version of the working feature with users yet. So we’re left guessing at how things will turn out. You can’t assume that just because you’ve met your ‘artistic vision’ that your project will automatically resonate with the audience. Sure, you know them well and you’re smart and creative and passionate and have done all the things you know how to do to make something great. (You have done that, right?) But in the end, they’re the judge of what works. They determine your success or failure. They need a chance to see what you’ve done and give their opinion. So getting something to ‘Done’ doesn’t mean just finishing up all the work items in the backlog. It means putting it into the users’ hands and getting feedback. And planning a project doesn’t mean squeezing in a bunch of stuff that just barely fits into the allotted time and rushing it out the door. It means plotting out a schedule that delivers working features with time to get direct user feedback NOT JUST ALONG THE WAY (in each iteration) but also at the end, when everything comes together and people can get a feel for the totality of the work. If you can do that, you’ll remove those nagging doubts and replace them with solid evidence that tells you that you’re on to something good. So queue up that last round of usability testing! And get ready for real success.